Before steaming ahead towards the new year, we decided to pause and reflect on 5 of the top changes made to Scopus in 2017. Have you explored them all? What: An updated Document Download Manager (DDM) and new free extension for Google Chrome users. Purpose: Makes it easier for you to download abstracts and full-text PDFs to your computer. What: Two big metrics were added to Scopus, offering more insightful ways to evaluate research performance, whether looking at serials (journals, book series, trade publications and conference proceedings) or articles. CiteScore metrics: Offers a more robust and accurate indication of a serial’s impact, with 8 different indicators to analyze. Freely available. PlumX Metrics – with five categories of metrics – is now the primary source of article-level metrics on Scopus alongside the Scopus citation count (along with percentile benchmarking) and Field-weighted citation impact. You can find the Article Metrics module on a Scopus Document details page, where a sidebar highlights the corresponding article-level metrics. Clicking on “View all metrics” opens a more detailed Metrics page, displaying all available metrics and the underlying content for further analysis and understanding. 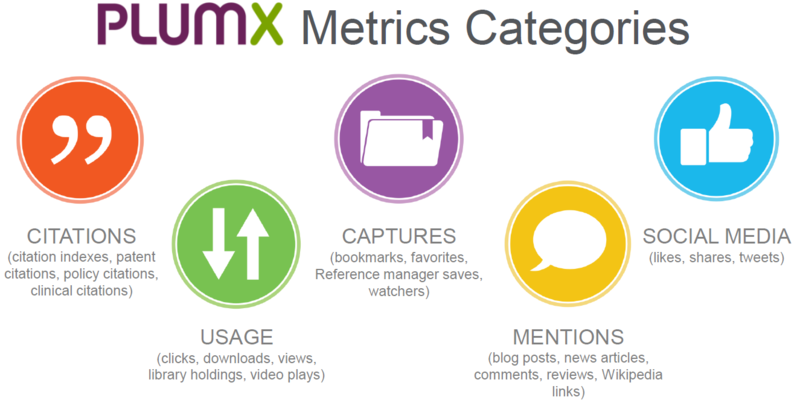 PlumX Metrics is Plum Analytics’ comprehensive, item-level metrics that provide insights into the ways people interact with individual pieces of research output (articles, conference proceedings, book chapters, and many more) in the online environment.